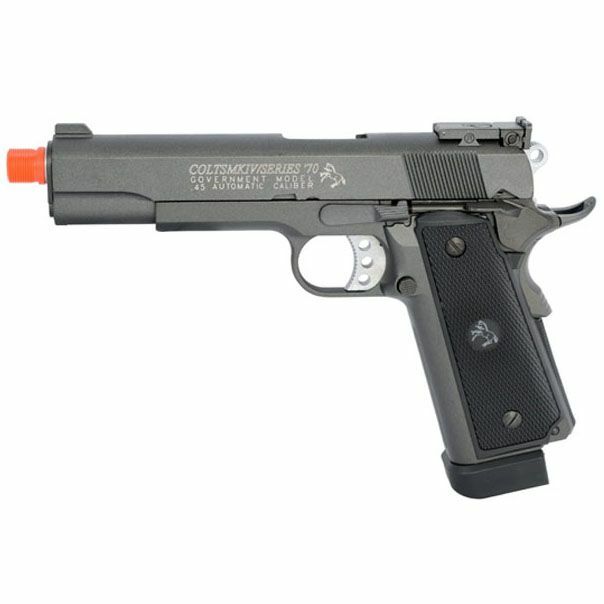 The Cybergun Colt 1911 MKIV CO2 Blowback Airsoft Pistol is a close replica of the real steel Colt 1911 45 auto but with a more modern Tactical look to it, sporting a Tac style trigger and hammer, double stack magazine, ambidextrous safety and adjustable rear sight. This gun is nearly all metal with very full blowback operation making it feel real to hold in the hand and shoot. Colt 1911 MKIV Pistol is an all metal gun with what looks to be fairly decent fit and finish but on the other hand it feels kind of light weight especially with the heavy magazine out of it compared to even the KWC 1911's I have reviewed so often. It may be that more aluminum is being used in this pistol which could actually be a good thing since aluminum would be a higher quality metal over your typical zinc alloy used in most Airsoft and Airguns these days. In terms of operation, I feel like some of the mechanical parts need a bit of break in time, but I have found this to be true with many real guns I have used.